and the immaculate sound-current of the Naad shall vibrate within. 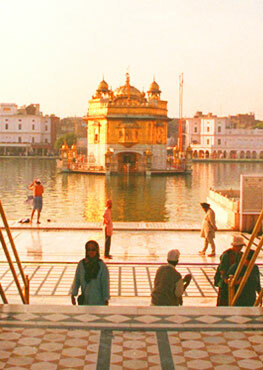 The Guru Granth Sahib Incorporates Raags or musical scales to heal the soul. Many raags are designed to heal, enhancing a particular mood, time of day, season, emotion or ambience. The music has developed continuously through time as a system capable of expressing the finest shades and degrees of emotion. If the words of the shabad are recited with the purest intention the results are healing and miraculous! Thus the Guru Granth sahib has a healing effect on the emotions and mind. In effect it uses "Naad" which means cosmic current or sound vibration to heal the soul. The human body contains energy channels or pathways wherein Chi or Prana flows. This is the energy network of the body. Meridians pathways run throughout the entire body and they deal with energy and states of consciousness. The purpose of the meridian is to transport the chi and thus bring healing to the body. This can create physiological and other changes as Chi circulates. Meridians work by regulating the energy functions of the body and keeping it in harmony. Blockages and uneven flow of the energy may result in malfunction of the associate organ and tissue, and in turn cause low healing ability. Stress, illness, aging and psychological problems can affect the functioning also. The food we eat, our mentality and even the words we use affect our body's energy. Someone who is happy, loving and has a bright outlook on life has a different "meridian body" than someone who is depressed, critical and unloving. Our actions, thoughts, feelings and emotions can have a direct effect on the meridians and the body. That is why it is important to align oneself with the soul for optimal healing. Gurbani is beautiful for healing. The Guru's words have a direct effect on the meridian system and helps purge the egoic mindset. The twelve major meridians correspond to specific human organs: kidneys, liver, spleen, heart, lungs, pericardium, bladder, gall bladder, stomach, small and large intestines, and the triple burner (body temperature regulator). Imbalance in your acupuncture meridian system can disrupt your organs, muscles, circulation, and a host of other problems. Identifying meridian system imbalances is often critical to restoring your body's ability to function. All meridians are important. The most important area is the stomach area (not stomach meridian). This area is also known as the "second brain" and is directly connected to our normal brain. This is where we hold our belief systems. If we have beliefs systems which are not in alignment with our soul, the energy here can become blocked and then cannot be circulated down the legs. A common health complaint is sore hips, knees and ankles - this is simply because the souls energy is not circulating from the crown to the feet. The ego refuses to let go of certain belief systems simply because of the fear that it will cease to exist. Each meridian has a psychological state associated with it. Reciting and understanding positive affirmations helps one to come to terms with one's thoughts and feelings. Gurbani can have a positive effect on the energy body and purge the egoic mindset. The ego plays a very important role in our consciousness, as understanding it is the bridge to the soul. Until we acknowledge the pain in our body and hence the thought, feeling and emotion associated with it, we cannot be brought into awareness. The ego is necessary as a bridge to our healthy existence, because the pain it causes provides a clue to what we are doing wrong in our lives. The more we acknowledge our thoughts, feelings and existence the more we can "rewire" our selves using Gurbani and the "I am I AM" affirmation. The "I AM" affirmation are a bridge to "I AM Presence" which is another term for our higher aspect that is eternal within us. It is the oneness which exists way beyond our bodies through all time. It is the presence of god individualised within us. "I am love" affirms that I wish to be in the state of love with others and the divine. "I am accepted" affirms that I wish to be in a state of acceptance with others and the divine. "I surrender" affirms that I wish to surrender my psychological pain to the divine so I may receive guidance. "I am I AM" affirms that we are one with the One in everyone. There are many affirmations which may be used, and they are best used after we surrender our thoughts and emotions to the divine. The most important ones are the one which balance the twelve meridians and this will be explained in further posts. The affirmations carry sound vibration or Naad just like the Gurbani and have similare effects to the shabads - to cleanse the psyche and to be present with the divine. I endeavour to to provide a holistic approach to health and wellbeing using Gurbani and affirmations as support..